We love our in-house designers! Why go anywhere else when you can work with some of the most trendsetting gals in town?? Vintage luxe paired with raw and organic with a touch of ethnic flair. Think vintage silver and crystal chandeliers - raw silks and richly colored velvet - unfinished wood grain and live edges with textural ferns or succulents. A mix of color, texture, and all things that bring energy to a space! What three items can you not live without this season? I'm a sucker for soft. 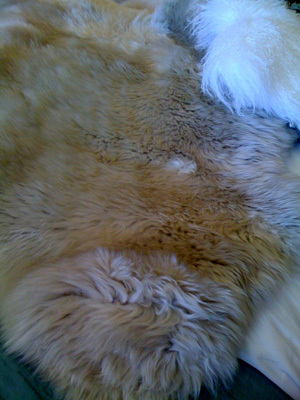 I just got the quatro super soft sheepskin rug in the natural ivory color. Its a four panel fluffy rug that fits perfectly in front of the sofa in my studio. It is so soft it could almost double as a guest bed! They come in singles too, and in every color. I'm also loving the single in the new peacock color as a throw on a sofa! Rest is something every body needs but often takes for granted. 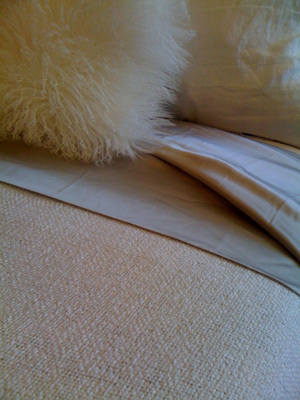 Creating a comfortable, cozy bed is so important and will remind us to give our body what it needs. I cannot live without my Legna sheets. They are luxurious and silky smooth and come from a tree fiber called lyocell. And, they are sustainable in all aspects - from the growing to the dying to the packaging - which I appreciate! I just perfected MY cozy bed by adding a soft chunky blanket to my already luxurious Legna sheets, cotton duvet, and silk velvet throw. To me, lighting is everything. It completes the way a space feels. I love to light a bunch of candles for a bath or on any cozy night. 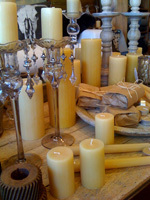 I especially love our beeswax candles because they burn clean an have a nice fresh scent. They work great with our mercury glass candle holders in various sizes. Anything that lets the light shine through and flicker for a nice ambiance is fabulous this season. Thank you Tiva for sharing some of your decorating tips! Come in to Wildflower Lamar and add her designer magic to your home! on your entire purchase with the American Cancer Society Holiday Shopping Card at Wildflower Davenport and Wildflower Downtown! 15 years in Austin, TX!